Registrations for Chief Minister’s Overseas Scholarship Scheme are open. Financial Assistance under this Scheme for studies abroad will be sanctioned to 500 minority students/graduates per year to pursue Post Graduate/Doctoral studies abroad. ** Minority students whose family income is less than Rs. 2.00 lakhs per annum from all sources are eligible. ** The maximum age under the scheme shall not exceed 35 years as on 1st July of the year of advertisement. ** Countries eligible under the Scheme- USA, UK, Australia, Canada, and Singapore. 60% marks or equivalent grade in foundation Degree in Engineering / Management / Pure Sciences / Agriculture Sciences / Medicine and Nursing / Social Sciences / Humanities. 60% marks or equivalent grade in P.G. course in Engineering / Management / Pure Sciences / Agriculture Sciences / Medicine / Social Sciences / Humanities. (v) The selected candidate has to join the concerned university within one year of communication of selection. Just follow the below steps to register for Chief Minister’s Overseas Scholarship Scheme For Minorities 2018-19. Step 1 : Go to the official website of Telangana Backward Classes Welfare Department through the URL provided above. 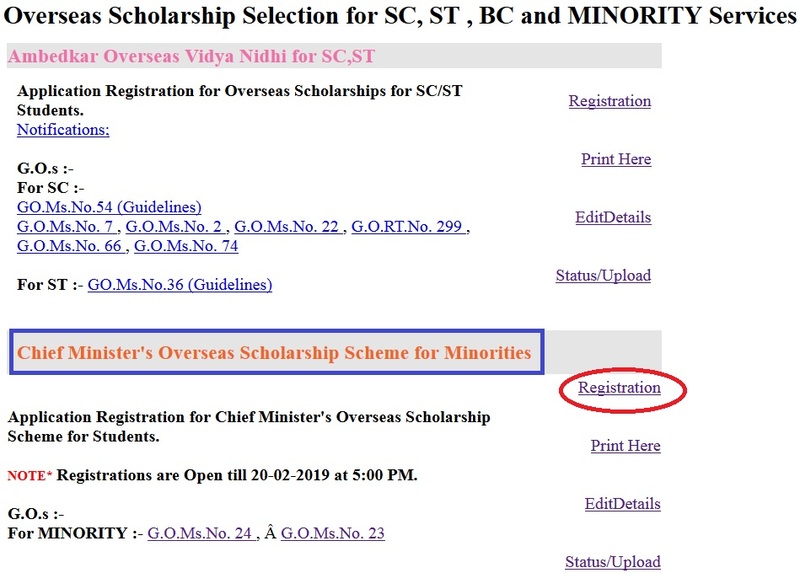 Step 2 : Then click on the Registration link under Chief Minister’s Overseas Scholarship Scheme for Minorities. Step 3 : Fill the following details and upload the required documents mentioned below. An amount of Rs. 5.00 lakhs shall be payable to the students upon production of the 1st Semester results. (b) Sanction proceedings mentioning that Rs. 10.00 lakhs is sanctioned to the individual towards fees and living expenses by way of a grant subject to his / her joining the course, shall be issued to the candidates selected by the Selection Committee. Registrations are Open till 20-02-2019 at 5:00 PM. I want to know, when will scholarship amount be credited to my account?